Shams Jilani, a Canadian from Pakistani origin had been general secretary for Hindi Literary Society and President for Canadian Urdu Society in the days that he made the history of holding both positions among South Asian diaspora in Canada. From last twenty-eight years, Shams Jilani is enriching the mainstream of Canada and another part of the world by his columns on current affairs, Islamic history, and humanities. The man from Richmond City, British Columbia is a well-recognized face who received the countless number of awards and recognition for contribution toward community services and for writings in Urdu language. His affiliations that cover a broader horizon from the founding member and chair for Richmond Multicultural senior society up to the President of Canadian Urdu Association reflected his efforts to strengthen the cultural harmony among the South Asian community. 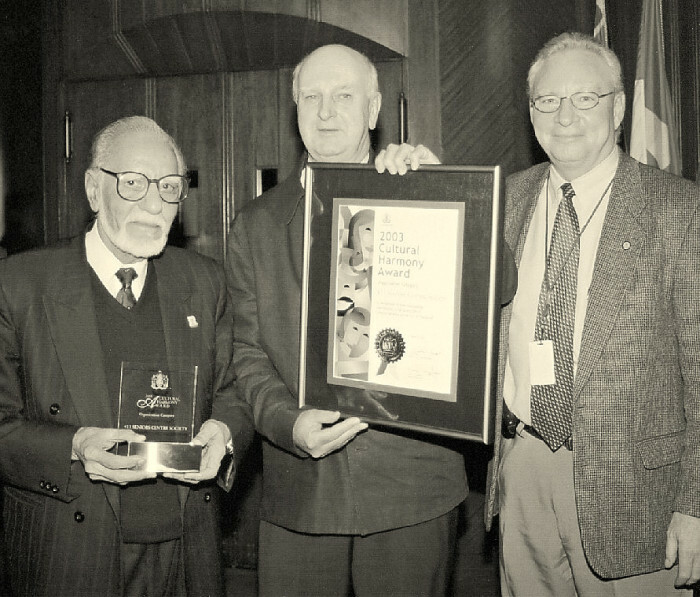 President Gill Evans and Chairman Dr. Shams Jilani receiving city cultural harmony award from Mayor of Vancouver, Lary Cambell in 2003. With more than twenty books in Urdu language and one in Hindi (Uttam hay Insan). The Urdu collection covers the diverse titles such as biographies of early Islamic personalities (the Prophet Mohammed (Peace be upon him), all righteous Caliphs , Hazrat Fatima, Hazrat Hasan, Hazrat Hussain, and Sahabiyat (May Allah be please with them), Islam & Haqooq Ul Ibad, Buniyadyat of Diabetes (translation of medical text from English to Urdu) that was written by Dr. A.R Minhas (M.D & F.R.C.S and Director for Diabetes Education). Also, he has two poetic collections, Urdu Sada Ba sehra & Gumane Moatabbar. For his book “ Islam Aur Huqqoq Ul Ibad, he received the best writer award from Honorable Christy Clark (Deputy Premier of British Columbia) in the literary event organized by Miracle newspaper. 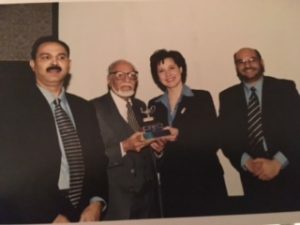 Shams Jilani receiving best writer award of Miracle (Community newspaper) for Huqququl Ibad aur Islam (Ethics and Islam) from Deputy Primer of British Columbia, Honorable Christy Clark in 2002. At the age of eighty-seven, he wrote biweekly columns in Miracle, The community Times Vancouver, Pakistan Times weekly from (the U.S.A and Canada). He is also the editor of the “ Aalami Akhabar, UK” run by prominent Urdu Journalist, Ex- Broadcaster of B.B.C, London, Mr. Safdar Hamdani. He had been chairman of “Mustafa Hamadani Academy” and was granted first “Mustafa Hamadni Award” in 2008 other than his sociocultural activities and participation in various multicultural organizations in Canada. From last twenty-four years, he has been the member of the various advisory Committees of Richmond City, British Columbia. Few of his followers/readers and friends were aware of his birthplace, family background, and glimpses from his early days of life. For a long time, I intended to explore the early days of his life especially in context with his background from Urdu speaking belt of United Provinces. I was blessed to have scholarly guidance received from him for the compilation of the work titled “The Arain Diaspora in the Rohilkhand region of India: A Historical Perspective,” and he was also co-author of the manuscript. The photograph provided to me by Dr. Shams Jilani in 2016 for authors introduction column for the book “The Arain Diaspora in Rohilkhand region of India: A Historical Perspective”. In the last five years, I got the chance to interact with a literary figure numerous times having hours of discussion on the different aspect of his life but we never talked about his early days. It was around 9.30 PM on 23/12/2017 in Al Majmaah, Saudi Arabia and I have an appointment with him on Skype. 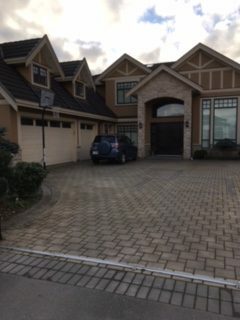 On the other side in Richmond City, British Columbia, he was going to start his routine activities of the day. It was usually a routine from last five years that I got at least a chance in a month to spoke with him. After initial greetings, when I made a request and explained my intent for calling him today, there was a momentary pause. With the hoarse voice, Shams Jilani spoke in his eloquent Urdu accent “Kya karoge un dino ko Jaan Kar, us me utar hai chadhao hai, inqilabi din thay woh”. Curbing my disappointment that prevailed over the curiosity, I made a second request. I further added your life is divided into three phases, first one in India, then Pakistan and now in Canada from last twenty-eight years. I want to write on the place and days that carries a special social context with early days of a prolific writer. After a moment of pause, there was a gentle consent and silence was broken. Mixed with apprehension, he said, “Kya Poonchna hai, Kya sawal hain tumhare, batao.” I broke the silence with my first question after delivering my thanks for providing his kind consent. I know some superficial aspects of your family and background. Can we discuss in detail about the place of your birth, family, ancestors background? I was born in a well-known family at Pilibhit in 1931 at Dhakia house. My forefathers came from Tehsil Fatehbad, District Hisar from Colonial Punjab in the late 18th century where our tribe i.e., Punjabi Arains who were widely populated in those days both in East Punjab. One of my ancestors named Haji Peer Buksh created a big zamindari estate at Bahdar Gunj, District Pilibhit. After his death, his estate was divided among his eleven sons. My great grandfather named Shiekh Maulana Jalal Uddin got Hulkari Dhakia and five other villages that prospered with time. Among these villages, the Hulkari Dhakia in Pilibhit became a center of his estate. After his death when Grandfather Shiekh Wisaluddin and his brother Shiekh Tajuddin took charge of the estate, they worked hard and purchased few more villages. When the Haveli was built in the early 20th century in Pakaria Mohalla (Quarter) of Pilibhit City, it was named as Dhakia house due to this ancestral affiliation. By the side of Haveli, I remember there was a big mosque and one of its gates opened inside our Haveli. My grandfather Shiekh Wisaluddin was active in socio-political activities of the district. He was elected as Chairman of District Board, Pilibhit and also played a key role in establishing a big Madarsa Manzur Ul Uloom at Village Dhundri. In 1912, it was built on his personal resources and the income of waqf properties worth approximately two hundred thousand Indian Rupees donated by his aunt Mohtarma Rahim Bibi and her son Sheikh Manzur Ahmad. 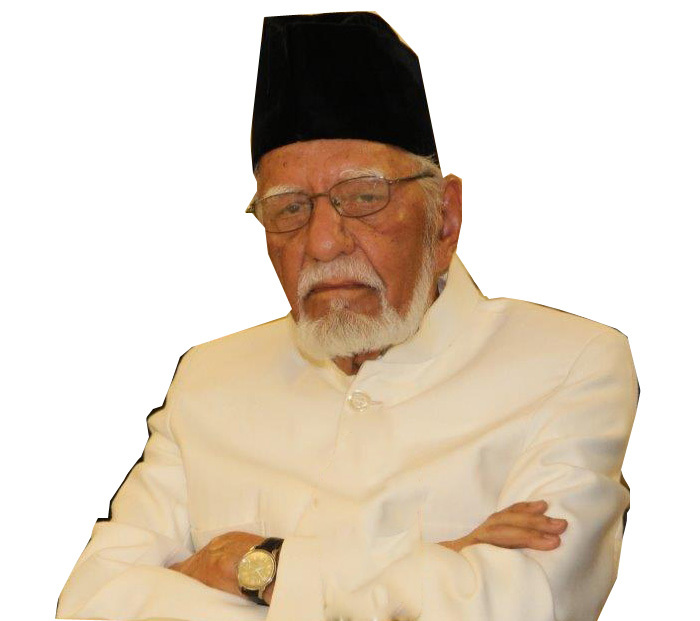 The madrasa has many shining alumni, one of them was Mian Faheem Uddin who did his post-graduation from AMU in 1935 and commissioned in Indian Financial services in 1939. Still, it is running as a senior secondary school in the same village at Pilibhit, UP, India. Later he retired as Military Accountant General of Pakistan army. My father Shiekh Kamaluddin along with his brothers and cousins were sent to Minto Circle at Aligarh Muslim University in 1924. Then Sheikh Riazuddin son of Shiekh Tajuddin, the cousin brother of the father was sent to pursue Bachelors in agricultural sciences from Edinburgh University, UK. In those days, the bachelor’s programme for agricultural sciences in India was not so well structured. My father came back to Pilibhit after completing his senior secondary from AMU. He was engaged in agrarian affairs and managed the zamindari possessions. In 1938, he was also elected as Vice Chairman of the District board. In the same year, he had established weekly Urdu newspaper with the name “Alkamal”. It was the very first newspaper of Muslim League in the district. 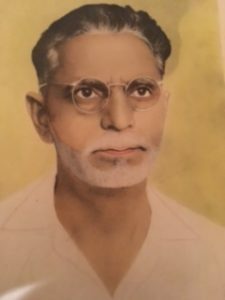 Mr. Kamaluddin, father of Shams Jilani born at Pilibhit in 1905 and passed away in 1961 at Karachi, Pakistan. Can you please provide few glimpses your early childhood days? How your early education was started. You remember any friendship from your childhood days. I remember those days, the time was divided between my paternal village, village Khamaria (maternal grandfather home) and Pilibhit city. I could remember the village home at Hulkari Dhakia was spread over an area of more than two acres. Separate quarters for every family member, rooms for servant and baithak for lodging male guests. It was massive home approximately had fifty rooms. When I was five years old, the permanent land tenancy act was passed in 1936. Although a great social movement, it appeared to be a torment for zamindars. My family also faced the brunt of this act. Mr. Haque, a District Forest officer from Lyallpur (Faisalabad) was the good friend of my grandfather. He suggested grandfather to converting our whole zamindari villages in Sir (Khudkasht/self-cultivated land) to be exempted from the new act. At that time there was very difficult to manage such a big project without machinery which is not available in India. Grandfather started a megaproject to convert all the villages in the category of Sir. For example, one of our villages Banskhera has an area of more than eight hundred eighty acres of land. I will reflect you the scenario from one of the villages that has more than 880acres of cultivable land to transform into a self-cultivable megafarm. More than ninety thousand Indian Rupees was invested in procuring around three hundred metal ploughs, cattle’s for drawing plough, pavement construction, small bridges and other infrastructure requirements that was a considerable amount in those days. Unfortunately, it was failed as many tenants who were supposed to hire for work joined some old tenants filed legal suit for their claims on the lands as a permanent tenant. As a result, the income was stopped and project exhausted family resources. When grandfather passed away in 1941, my father gave consent to all tenants as we had more than two hundred fifty cases filed by tenants on our zamindari lands. My father was maximally affected by the aftermath of these disturbances. His extensive engagement with legal suits related to properties affected my structured formal education. Although two separate tutors were arranged for teaching me Arabic, English and other subjects. Mr. Sabir Ali came to teach Arabic and Mr. Ismail teaches me English and other subjects. I was blessed to receive the early lesson of Urdu and Persian from my father. I had two close friends; the first one was Mohamed Ahmad who was also a relative from mother side. The second one was Mohammed Hanif who belonged to Muslim Khatri community widely popular as Punjabi Muslims/Saudagrans. His father runs a shoe shop adjacent to the Simons parks at Pilibhit city. The shop is still present with his family and whenever I visited Pilibhit, I used to visit my childhood friend. Mohammad Ahmed is also alive and around 90 year’s old living at village Khamaria. What was the circumstance in your city in 1947? When exactly you left for Pakistan and what was the reason for your migration? My entire district and city appeared to be calm during the event of partition. Although some of my relatives were associated with Muslim League. Khan Bahadur Imtiyaz Ahmed was M.L.A (Independent & affiliated with Nawab Chatari) and relative of my wife. Pilibhit city faced a devastating riot in 1950 when the group of mob rousers forced Muslims to leave for Pakistan. I left my city in 1950. I went to Kishoreganj in East Pakistan (Now present Bangladesh). I left my homeland for personal reasons. Due to family circumstances, I was not able to pursue higher education at that time it was the trend in my extended family. My cousin and youngest Uncle were studying at Aligarh Muslim University at that time. I was titled by the relatives with the name of “Shahzada Ali Khan” as the mark of sarcasm as they perceived I was living a comfortable life on riches of forefathers. Shahzada Ali Khan was the son of Agha Khan. This created a burnt desire to stand independently on my own feet. I have tried up to my best and achieved everything later to match the expectation from my parents and family members. At that tender age, I saw many people from my surrounding left for Pakistan. My uncle ( Khalu) and Aunt (Khala) were already living in East Pakistan and second up to that time passport for not required for Indian nationals in East Pakistan. Therefore, I took a big step and said Alvida (goodbye) to my homeland and family members. I joined diploma engineering in electrical in 1951 and also initiated part-time business ventures in Kishoreganj, East Pakistan (Bangladesh). In 1952 destiny brought me back home for few weeks, and during this trip, marriage was arranged. My wife Quresha belonged to the same village Khamaria that was the birthplace of my mother and the place for me was like my second home. Four years younger to me born in 1935. She belonged to middle-class landowner family of my tribe. She was educated at home and only took primary education from the vernacular school that existed there. Khan Bahadur Muhammad Imtiaz Ahmad, a prominent face in politics from our tribe belonged to the same village and was among her relatives. She reflected all Punjabi features in her looks as physiognomy of Arain females. Her good height, fair complexion, generous behavior, god fearing personality, soft spoken and always keen on learning are few of her attributes that I perceived in early days of marriage. She continued her journey with me as the companion of all sorrows and happiness. She was always a motivational source of all my achievements in last sixty-five years of married life. On 05th March/2017 she left me alone with her memories and started her first step to the journey that we all have to meet. 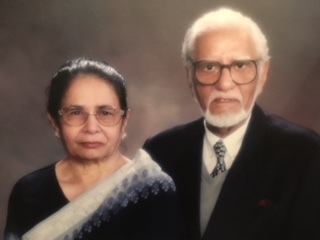 Shams Jilani and his wife Mrs. Quresha Jilani on 50th anniversary of their marriage in 2002. Mrs. Quresha was born in Village Khamaria, Pilibhit in 1935 and passed away at Richmond city, BC, Canada on 05th March 2017. Sorry for the deviation, I went back again to East Pakistan after celebrating my happy marriage. I was living with my Khala (Aunt) and Khalu (Uncle). Actually, my Uncle Mr. Tajuddin (Uncle) who was Station Master at Railways in Kishoreganj got the transfer to West Pakistan in 1954. He was a Railways employee in British India and opted for Pakistan Railways after independence in 1947. Kishoreganj (East Pakistan) was his first posting in the newly created state. He was looking for the transfer as most of the acquaintances and relatives from United Provinces were stationed in Karachi. In 1954, we reached Karachi (West Pakistan) by a sea route. I think it was the month of March and we boarded the ship from Chittagong. It was around seventeen days journey with few hours halt at Sri Lanka. My wife accompanied his elder brother Mr. Maqbool Ahmad who has recently finished his Bachelors in agricultural sciences from Kanpur University in UP, India to join me at Karachi in the same year. My parents and siblings joined us in 1958. In 1954, I started to serve Military engineering services but left my job after some time. Meanwhile, I also took high proficiency in Urdu Language and literature from Punjab University in 1956. Later I switched many fields venturing from varied business to regional and provincial politics. My stations were switched in all these years between Karachi and Mirpur Khas, (third biggest city of Sindh). Thirty years of the later life was passed in earning bread and making the better life for my wife and kids. 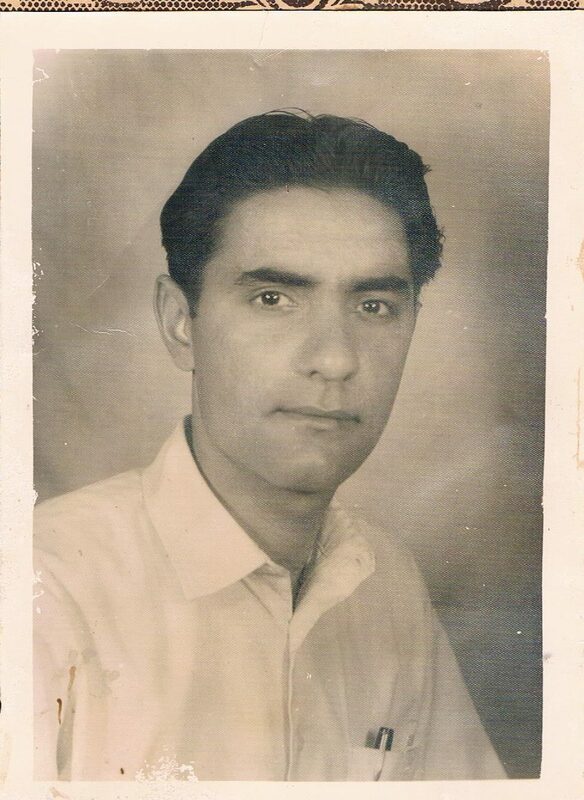 The photograph of Dr. Shams Jilani of 1960 when he was living at Mirpur Khas in Sindh. Anything you missed from your birthplace Pilibhit in India where you passed twenty years of your life. Did you ever visit India after 1952? Definitely, there are memories that I could recollect from my early life at Pilibhit. When I was a child I used to enjoy tasty “Alu Kachodi” quite popular in the city made by Mr. Prasadilal. He used to run street food stall nearby our home. I would never forget when I and the son of my neighbors, Hamid Jilani used to go together. Hamid was our distant relative whose father was President of District Muslim league at that time. In 1948, he joined BSc (Engineering) at AMU along with my cousin Mr. Riaz Faruqi. I could remember both of them were among the few earliest technocrats in my district. Hamid moved to Pakistan with his family in 1952 and after few years to Zurich, Switzerland for higher studies. Later on, he took Swiss nationality. When I reached India from Canada, then I tried to locate Prasadilal but unfortunately, he was not alive. Although his street stall was changed in a small restaurant at the nearby site and his grandsons were running the business. From 1952, I had made more than ten visits to India. After shifting to Canada, I was fortunate to have more frequent visits as visa process from here was easier. My last visit to homeland Pilibhit and off course other parts of North India was in 2012. My son Mr. Masroor Jilani also accompanied me during this visit along with his mother Mrs. Quresha Jilani. Connecting with Pilibhit so frequently in all these years never gave me feeling that I was away from my birthplace. How the literary interest cultivated in your childhood days. Does anyone else in your family who was also associated with literary activities? I was born in a family where there was a big room for honing literary hobbies. Love for Urdu was coming from ancestors. 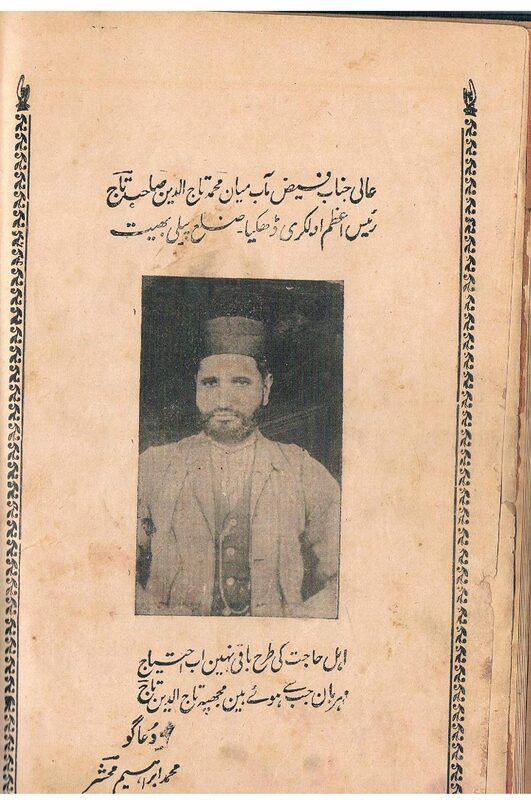 My great-grandfather, Maulana Shiekh Jalaluddin was a scholar of Arabic, Persian and Urdu. 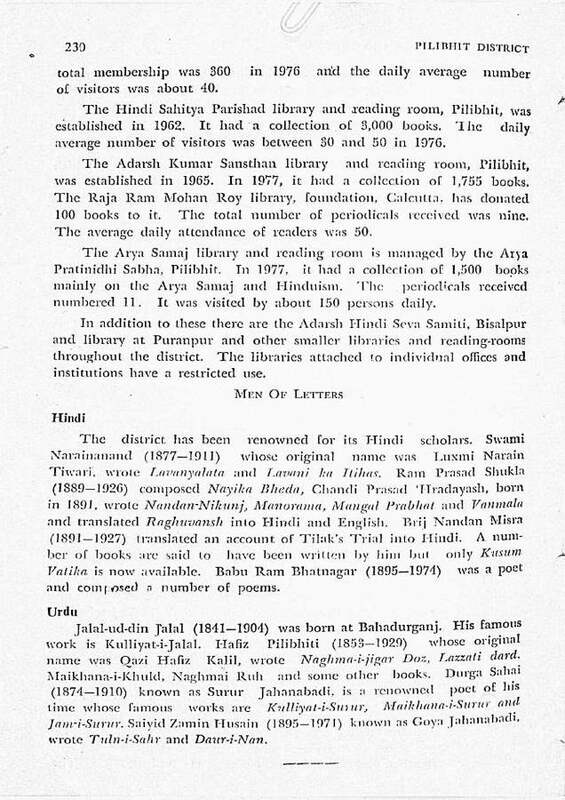 The District Gazette of the Pilibhit showed his name as one the Urdu poets in the title of literary personalities. He wrote his own collections of poetry with the Nom de Plume of “Jalal”. The District Gazette of Pilibhit, 1960 citing the name of Dr. Shams Jilani Great Grandfather, Jalauddin Jalal under the heading of “Men of Letters”. It was first published as “Kulliyat Jalal” from Agra after his death in 1904. Its second edition was published by the efforts of Grandfather younger brother with the addition of his own collections in 1947. He wrote his poetry with Nom de Plume of “Taj”. The youngest brother of my father, Mr. Zakauddin was enrolled in Bachelors programme of Urdu in 1950 at AMU, Aligarh. During his doctorate in Urdu, the notable poet of India, Shahryar was among his contemporaries and good friends. Uncle used to write with the pen name of “Shayan”. He passed away at Pilibhit in 2003. My father after coming from Aligarh started his newspaper with the name of “Al Kamal”. Started in 1938, it was first of the newspaper covering the activities of Muslim league paper. It covers sociopolitical news, columns and regional perspectives and poet too. I was around thirteen when my first article was published in Naseem Anhonvi Urdu digest” Hareem” published from Lucknow in 1944. Then few of my write-ups were published in Nayi Duniya. I remember that I read my verses in Mushaira held in Dhaka at 1953. At that time Akhtar Lukhnawi was secretary general of Anjuman- Taraqqi- e -Urdu in East Pakistan. Can you recall anyone from your family who had a larger influence on your ideologies and personality? My grandfather was a role model for me. He was the man who had a vision for his family and community. He has the courage to withstand difficult situations. He maintained acquaintance with great social leader and educationist of his time Sir. Ziauddin Ahmad. All my uncles and father were kept under his noble supervision at Aligarh. After his death, the family found a couple of letters, which were exchanged between him and great educationist, Sir Ziauddin Ahmad. As a Chairman of District Board, Pilibhit he proved himself as an effective leader and administrator. He passed in 1941 when I was ten years old. His grave is located in the graveyard of Feel khana Mohalla (Quarter) at Pilibhit. 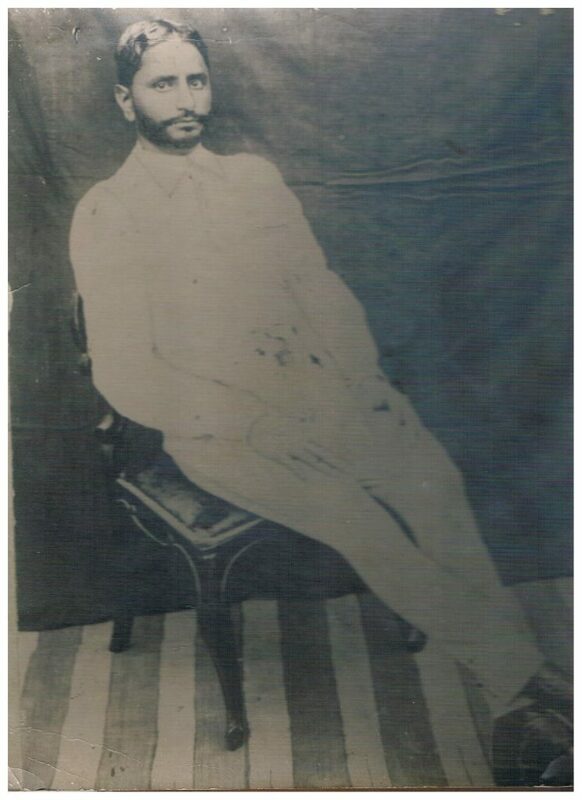 The only surviving portrait of Sheikh Wisaluddin, the grandfather of Dr. Shams Jilani. It was taken at Aligarh in 1924. Farsh gul bistar tha apna Khaak par sote hain ab! Khast zer e sar nahi ya takia tha zanua e dost! Once we have pillows even for supporting my thighs but now even brick is not available for the support of my head. The second one was my Nani Hamidun Nisa Begum who taught me beautiful lessons of kindness, and humanity. The third one who had a larger influence on my life was a Sufi scholar, Hazrat Meharban Ali Shah. My maternal grandfather Shiekh Fida Hussain was one of his murid (disciple). He was Sayyad (descendant from the house of Prophet (Peace be upon him) and belonged to Akora Khattak (Small town of Nowshera District in North West Provinces, now in Pakistan). I remembered that he used to visit my nana home in Pilibhit (United Province) and stayed for a long duration as an honored guest. In fact, my name Mohammad Shams Uddin Ahmad was given by him. Initially, it was Mohammad Shams Uddin but some argued that the person with this name exhibit Jalali behavior. So he added Ahmad at the end and said he will become Jamali. This was the man who introduced me with “Tasawwuf” at an early age of my life. He has affiliated with “Qadiriyya” tariqa (Sufi order). At the tender age of five years, I was blessed to receive his kind company and love from this noble saint. He loved me like his own son. For the rest of my life, I found this spiritual connection as nourishment and enlighten for my soul. It was later in 1974 I found Hazrat Maulana Waqaruddin as a murshid Kamil (Perfect Spiritual guide) and I took the bait (pledge) in “Qadiriyya” tariqa (Sufi order). He was one of the leading scholars of his time, titled as Mufi E Azam, Pakistan and has ijaza (permission) to give bait (pledge) in four tariqas (orders) of Tasawwuf. He was originally from village Khamaria, Pilibhit, and brother of my Khalu (Uncle). Later on, we also became relatives as his son Jameel Waqar was married to my daughter Uzama Waqar. They were currently living in Houston. Now at the age of eighty-seven more than three thousands of your columns have been published in Aalami Akhbar and different other newspapers. More than twenty books and poetic collections were also published. What are your goal and mission? Writing is now part and parcel of my life. It’s a way to express my feelings whether joy or grief. I tried to reflect on the current affairs, humanities, and Islamic history. Ibn Kathir is my role model in writing on Islamic history. The day when my beloved wife Quresha passed away, I expressed my agony by writing a column that was published in many Urdu newspapers. It was titled as “Hum safar ka safare Aakhirat”. I thought she would be happy from her resting place to saw the commitment towards my mission for which she has supported me in her lifetime in a best possible manner. I believe the life is a larger learning context believing that learning is from cradle to grave. May Almighty Allah give me the courage to stand with truth? I reserved my life for last 25 years to serve the humanity and Islam in the entire world. Thank you very much for providing a great time and opportunity to explore the valuable moments of your life. Any message you want to add on after providing me such a great narration and context of your life. Shams Jilani ended one and half hour talk in such simple words. I would like to write it up in Roman Urdu.“Main ek mamuli sa Insan hun. Urdu meri madri zuban hai. Bus apne buzurgun se jo kuch thoda bahut hasil kar paya hun us ko apne qalam ke zarye app logon tak pahunchane ki koshih karta hun. Aap nay bahut israr kia tu maine ne appko apne haalat ki sachaion sey ru shanaskar Karwaya hay, Warna main apne Khandan aur apne bare me bhi zyada logon ko nahi batata hun”. After receiving a lot of blessing from his side, the wonderful talk was ended. I found myself lost in the early life of the great literary person at Pilibhit. May Almighty bless him healthy and long life.